On a mission inspired by sporting superstar Michael Owen, the CEO of one of the world's largest independent financial advisory organisations - and 19 of his team - conquered the Dubai Marathon on Friday. 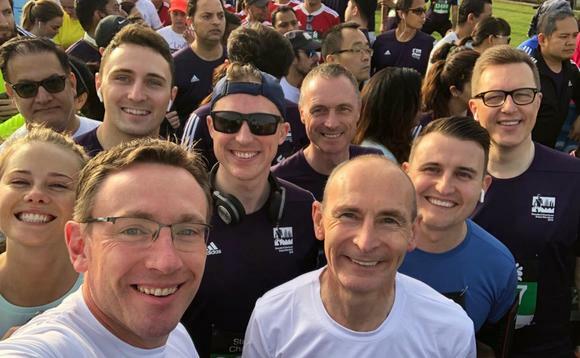 Nigel Green, chief executive and founder of deVere Group (pictured above, centre), which has its HQ with three offices in the UAE under the brand deVere Acuma, together with his colleagues joined runners from across the world as they pounded the streets for the 2019 Standard Chartered Dubai Marathon, in the heart of the Jumeriah and against the backdrop of the iconic Burj Al Arab. Michael Owen, a former striker for Liverpool, Real Madrid, Newcastle United, Manchester United and Stoke City, was amongst the first to show his support for deVere Acuma's efforts to raise money for The Manchester Eye Hospital. Speaking on completing the challenge, an elated Nigel Green said: "It was fantastic to take part in the 20th edition of Dubai Marathon on this spectacular course, which has records that rank among the fastest times ever run in the history of marathon running. "Even though the weather was kind to us, we all needed to dig deep for the last few kilometres." He continued: "Thanks to the hard work of the deVere Acuma runners and everyone who generously sponsored our efforts, we will be able to help support the life-enhancing work of The Manchester Eye Hospital. "I was inspired to raise funds for this incredible organisation by the legend that is Michael Owen when he came to our Christmas awards. It is a charity close to his heart as this hospital specialises in trying to find a cure for Stargardt Disease, a degenerative eye condition that affects his son. "In addition to this, we will be able to sponsor 20 orphaned children for a year via the Emirates Red Crescent. "This sponsorship will give these vulnerable children the opportunity to build a better and brighter future." Mr Green went on to say: "As a responsible global finance brand, we are delighted to work with both The Manchester Eye Hospital and Emirates Red Crescent, as our alliance with them allows us to give something back to those communities in which we operate. "Everyone who took part showed incredible commitment and energy and I am immensely proud of the whole deVere Acuma Team!" The deVere CEO concluded: "This event brought together our love of fitness, our love of working competitively as a team, but most importantly supporting those less fortunate than ourselves."